Since it started in 2012, KSSM was an opportunity for us at Buttershaw Baptist Church (BBC), in connection with Bethel, Redding, California to share our journey in working from God’s power through us. In particular, there was a focus on practicing spiritual gifts of prophecy and healing while understanding our identity in God’s Kingdom. We haven’t stopped our journey, but KSSM has sadly had to stop for the time being. 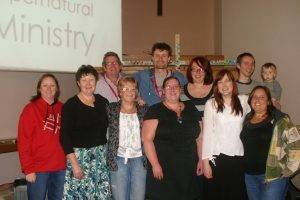 We are delighted that Christians from around the North of England continue to be interested in practicing the Supernatural and journeying with other like minded individuals. We know this by the number of visits to this website and the calls and inquiries we take in the office. We hope that the information below is a helpful way of explaining why KSSM is not currently running and that it is not connected to any other School of Supernatural Ministry in Bradford. We hope you stay tuned while we plan for the future of BBC but don’t wait to pursue what God has planned for your journey with Him. KSSM was run through Buttershaw Christian Family Centre (BCFC). Significant changes to the leadership of BCFC occurred in September 2016. The remaining trustees reviewed KSSM against their charitable objective ‘to provide social benefit to the residents of Buttershaw’. A decision was reached that BCFC could not, in good faith, use its resources to run KSSM beyond June 2017. A change of leadership at BBC was determined in June 2017. Until then we were not in a position to plan for something like KSSM and so it simply and sadly stopped. For anyone who is interested in joining a similar course, we recommend that you visit our friend Kelly Anderson who directs the school in Teesside. Kelly came to Buttershaw in January 2012. She developed and led KSSM before moving on in June 2014.